Background: Traffic volume and speed is going to be increased in Indian Railways successively, leading to higher stress in staff connected with train operations. The jobs of railway engine pilots come under the category of high-strain jobs, necessitating a need to conduct multicentric study to unfold the factors associated with occupational stress and organizational strategies. Materials and Methods: Present study covered 185 railway engine pilots and office clerks working in various railway zones by incidental method. Occupational Stress Index (OSI) test developed by Srivastva and Singh, questionnaire of specific stressors constructed by authors and laboratory test battery for psychological screening of high-speed train pilots were used as tools. Results: Means of OSI and all the 12 occupational stressors of railway engine pilots were found significantly higher to that of office clerks. Means of OSI and occupational stressors of goods train pilots were significantly higher in comparison to high-speed train pilots and passenger train pilots. Study revealed positive correlation of speed perception and complex reaction time tests and negative correlation of other constituent tests of laboratory test battery to OSI test. Highest subgroup of stressor observedwas role overload followed by role conflict. Conclusions: These findings provide a prima facie evidence of higher occupational stress among railway engine pilots because of identified specific stressors prevalent in their job and explore the possible intervention strategies for its reduction. Significant correlation is noticed between OSI and laboratory test results, indicating its relevant utility in preliminary psychological screening. Indian Railways is taken to be locomotive of national development. Traffic volume and speed in railways is going to be increased successively with the passage of time and it is ought to create stress in staff connected with train operations. Karsek and Theorel (1990) have rated the occupations into four categories: active jobs, low-strain jobs, passive jobs and high-strain jobs. The jobs of railway engine pilots prima facie come under the fourth category as they have to perform long hours of duty and have to follow rigid procedures and are allowed little latitude for taking breaks or time off for personal needs. 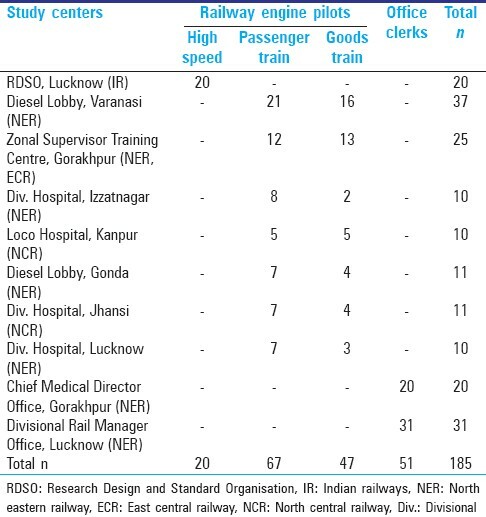 Report of Research Designs and Standard Organisation (RDSO), 1997, revealed higher level of stress in railway driver's job in comparison to other job categories like assistant station masters, train examiners and office clerks. Pestonjee (1992) identified jobs on the organization, the social sector, and intro-psychic sector as important sectors of the life in which stress originates. The causes and consequences of stress are related in complex ways. Pareek (1983) identified 10 stressors related to role demands. Hans Selye (1975) adds that stressors are additive. Common consequences of stress include individual and organizational consequences as well as burnout. Individual consequences are emotional reactions, cognitive reactions, psychological and physiological presentations. Organizational consequences present as decline in performance, withdrawal (absenteeism and quitting) and turnover, decreased motivation and satisfaction. Perhaps the biggest and incalculable costs of occupational stress are human causalities due to errors made by workers. It is imperative for the Indian Railways to develop stress management strategies that can equip the human resource with effective coping styles. For developing effective stress management strategies, it appeared desirable to study occupational stress among railway engine pilots, as they are directly related to train operations. To empirically verify if there is higher level of stress and occupational stressors in the jobs of railway engine pilots in comparison to that of office clerks. To compare the level of occupational stress and occupational stressors among railway engine pilots according to their different job conditions. To find the correlations between laboratory test battery results and Occupational Stress Index (OSI) of high-speed train pilots. To identify typical sources of specific stressors for railway engine pilots. To explore the possible intervention strategies for reduction of stress. The present multicentric study covered 185 railway engine pilots and office clerks working in various zones by incidental method [Table 1]. The purpose of the study was explained to all the participants and their consent was obtained. OSI test developed by Srivastva and Singh (2000) consisting of 46 items of 12 subscales (occupational stressors) rated with 5-point scales was used to measure occupational stress. Reliability index by split-half method is 0.93 for OSI test and 0.60-0.84 for subscales. Validity of test in relation to various measures including ill mental health indices is positively correlated (2-4.9). All study participants were subjected to OSI test. Questionnaire of specific stressors contributing to 12 subscales of stress in the job of railway engine pilots was constructed based on conclusions made by authors in a brain storming session where each subject was asked to give specific conditions relating to his experience in his job which created that type of stress in his mind. Validity of the questionnaire (containing 50 items rated with "yes" or "no" option) was rated satisfactory by the target group and managers. Questionnaire of specific stressors was subjected to all the railway engine pilots including high-speed trains. Current laboratory test battery for psychological screening of high-speed train pilots by RDSO, Lucknow, was used to find out its correlations with OSI test. It consists of various tests such as test of form perception and perceptual speed (Fp), test of complex reaction time (Crt), test of speed perception (Spt), test of visual differentiating attention (Vda-f and Vda-s), test of concentration (Gbt) and composite T-score calculated on parameters. All high-speed train pilots were subjected to the laboratory test. The data collected through various tools were tabulated and put to rigorous statistical treatment. Descriptive statistics like percentage, mean, Standard Deviation (SD), t-test and coefficient of correlation (r) were used on need basis. Mean of OSI of railway engine pilots was higher to that of office clerks and difference (t = 9.466, P < 0.01 level) was highly significant [Table 2]. Means of all the 12 occupational stressors were comparatively higher in engine pilots than office clerks [Figure 1]. Mean of OSI of goods train pilots was higher in comparison to those of high-speed train pilots and passenger train pilots and differences (t = 5.25 and 5.31, P < 0.01 level) were highly significant. However, difference of OSI between high-speed train pilots and passenger train pilots was found to be statistically insignificant [Table 3]. Means of all the 12 occupational stressors of goods train pilots were higher in comparison to those of high-speed and passenger train pilots. First highest stressor in all pilot categories was role overload, followed by role conflict [Figure 2]. To find the correlations between laboratory test battery results and OSI, results of various constituents of laboratory test of all the 20 high-speed train pilots were tabulated and coefficient of correlations (r) between the test results and OSI were computed. High-degree positive correlation of Spt (r 0.796), low but definite positive correlation of Crt (r 0.346), low but definite negative correlation of Gbt (r −0.28), Vda-f (r −0.404) and Vda-s (r −0.280), moderate (substantial) negative correlation of Fp (r −0.558) and composite T-score (r −0.613) to OSI were observed [Table 4]. Highest numbers of identified specific stressors were related to role overload like excessive strain on drivers in sighting signals due to defect in signaling system, dim light of signals, changing position of signals abruptly, poor visibility; responsibility related to carriage department being shouldered by drivers; long hours of duty and being away from home for long hours [Figure 3]. 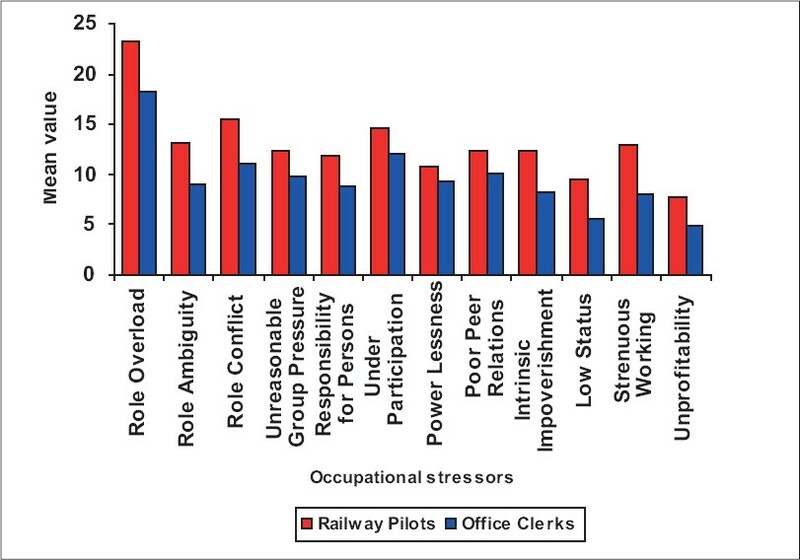 It is verified that there is higher level of stress and occupational stressors in the jobs of railway engine pilots in comparison to that of office clerks. The result is consistent with the classification of occupation by stress. The present study offers empirical evidence toward possibility of railway engine pilots working under higher occupational stress conditions. These findings are in consonance with reports of RDSO on occupational stress,  requiring urgent stress reduction. 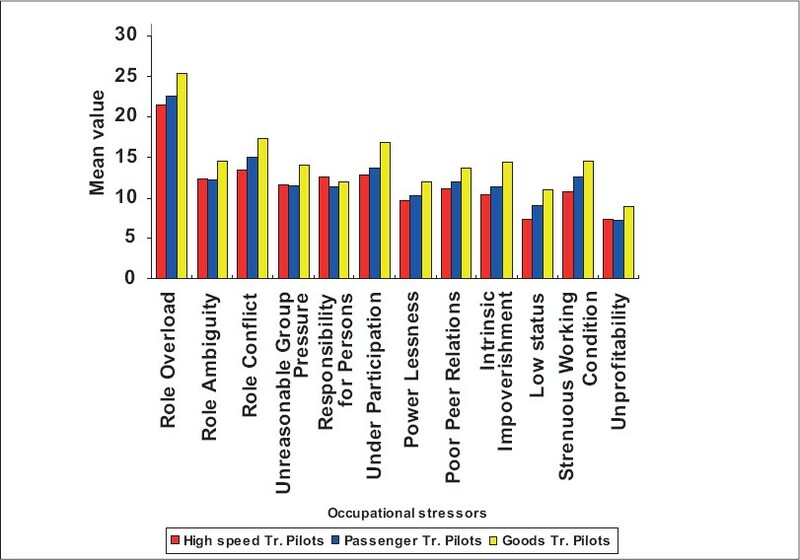 OSI and means of all the 12 occupational stressors were comparatively higher in goods train pilots than in high-speed train pilots and passenger train pilots, pointing that source of dominant stressors differ due to job conditions within different categories of train pilots. It points toward the need of suitable macrolevel strategy. OSI test is simple to administer. Significant correlation was noticed between OSI test and laboratory test results, indicating its utility as preliminary psychological screening of railway engine pilots before sending them for complex laboratory tests. The present study was specifically designed to identify macrolevel stressors through scientific method. The intervention was conducted on a limited sample of 185 railway employees. Generalizations made on the basis of this study should be carefully considered and further studies need to be undertaken to replicate the findings. Management must try to keep employees free from various role stresses, and stress management programs should be implemented at work places to improve the quality of life and health as being done in most of the foreign countries. In order to alleviate the occupational stress of staff, strategies to reduce stress, both at macrolevel (organizational level) and at microlevel (individual level), are to be designed, testified for practical usability and carried out in such a way that as far as possible stressors relating to organization are removed and stress tolerance thresholds of individuals are enhanced to enable them to withstand the possible future stressors. Various aspects of occupational stress have been examined and actions need to be taken for various facets as identified in the present study. 1. Karasek, Theorel. Healthy Work. New York: Basic Books; 1990. 2. RDSO. Report No. PTD 3. Lucknow: Research Design and Standard Organisation. Psycho-Technical Directorate, Ministry of Railways; 1997. 3. Pestonjee DM. Stress and Coping-The Indian Experience. New Delhi: Sage Publication; 1992. 4. Pareek U. Organisational Roles Effective. New Delhi: McGraw Hill; 1983. 5. Selye H. The stress of life. New York: McGraw Hill; 1975. 6. Srivastva AK, Singh AP. The Occupational Stress Index Manual. Varanasi: Manovaigyanic Parikshan Sansthan; 2000. 7. Parasuraman S. Role stressors, Social support and well-being among carrev couples. 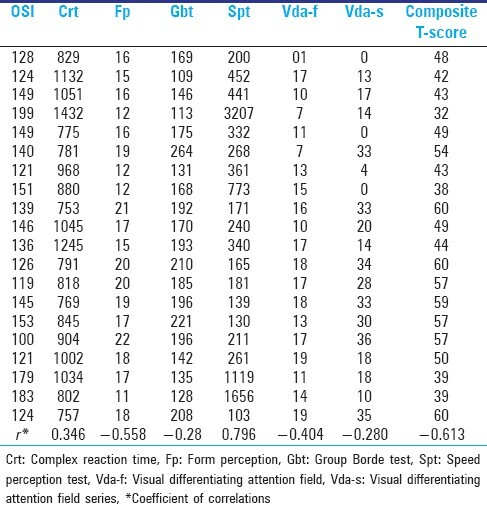 Organ Behav 1992;13:339-58.